I have this thing about blue... I'm sure I've mentioned it before. 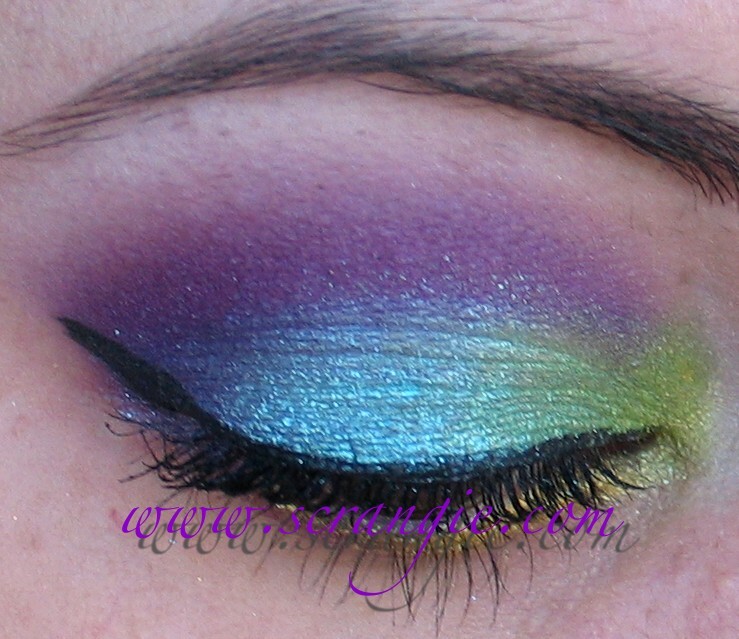 I probably mention it every time the topic of blue eyeshadow comes up. I just have a hard time wearing blue eyeshadow. But then there was Futuristic Glamrock. Futuristic Glamrock changed everything. My skin always looks so orange and red with the flash... But, these were taken at night and natural light wasn't an option. I'm not sure if you can really tell from these pictures, but Futuristic Glamrock is made of tiny iridescent sparkles. It's mainly a light turquoise blue but it reflects a deeper blue at some angles and purple/pink at other angles. It's way prettier than I ever imagined it would be. I don't know why I waited so long to get it. Bifrost is also spectacular- yellow with subtle iridescent multicolored sparkles. For some reason this look reminds me of ska. One more thing worth mentioning: the cashier at the grocery store- who was actually in the next lane, not my cashier!- came over to tell me how crazy she was about my blue eyeshadow. She said she loved the color and had one sort of like it that was almost gone. I wish I could have talked to her longer about it but she had a lot of customers in line. This cashier usually compliments my nails and makeup... I bet she's one of us! I think the purple shadow brings out the purple color shift in Futuristic Glamrock. You can see it a little in the first flash picture, in the shadowy area near the outer crease. I love Futuristic Glamrock and Danse Macabre together! They're both duochromey-iridescent and they totally play off of each other. I need a full size Danse Macabre, it's so freakin' gorgeous. Bright grassy green with yellow gold pearly duochrome. Super smooth and amazing pigment. 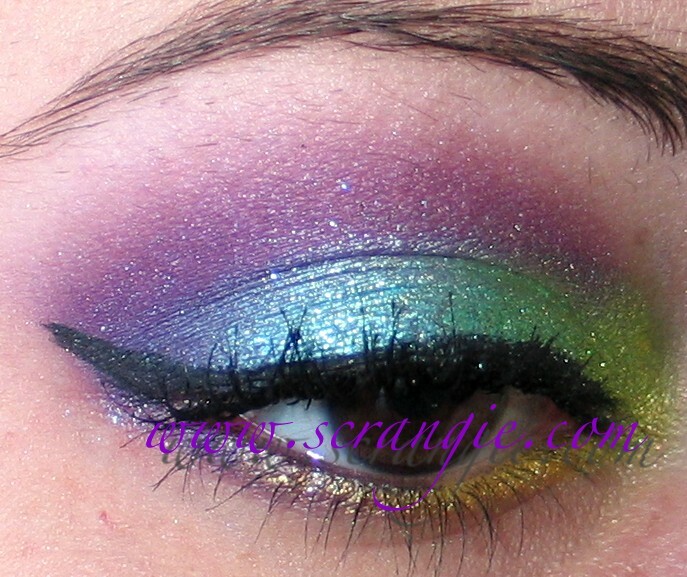 Now I have a question for Fyrinnae fans. Love Potion. What do I use it with? Every look I try to do with it ends up looking bland or just odd. I can never think of what to combine it with to make it shine. I need ideas for combos! I'm mystified by this color. Both are really nice! Love it! Wow that blue is gorgeous! Do you rate the Too Faced shadow insurance? I love your eyeshadow looks, they're all so awesome! Love Potion on iner 2/3 of lid with a warm purple (Forbidden Lover? Princess of Darkness?) 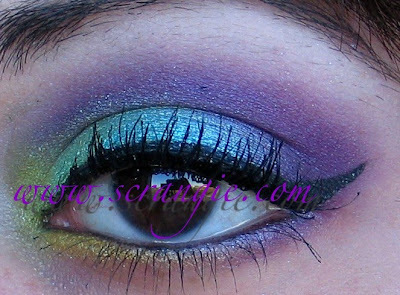 on outer 1/3 and crease with a light turquoise lower lashline (Bali Mynah?) and Randy Ferret as liner. That's all I can think of right now, hopefully one of those is useful. I love all your makeup looks, but the blue is really great on you! i like the super colourful one, reminds me of a peacock! and i was wondering whish lash blast mascara you used? When I was a kid in the 60's, I started playing with mom's liquid eyeliner. I was utter crap with it, and ever since, I've used either shadow or a pencil for eyelining. I have NEVER seen such beautiful technique as you have. Do you have a how-to for the way you get such a perfect cat-eye? I really like the first look - and then I scrolled down and the second is sooooo Pretty!!! And I'm jealous of your eyeliner cause I just can't get mine to look decent. Stunning looks! I love the colours of the second one in particular. Great job as always! I LVOE that second look! So pretty! First, I LOVE Futuristic GlamRock! It's awesome, especially with Pixie Epoxy. Second Love potion works well with Chaotic Evil if you want more pink. It also works with Cupcake Sprinkles if you want lavender. I like it with Javan Rhino if you want Turquoise. It would probably work with Futuristic Glam Rock. I think it would work with Sugar Skulls and Darling Misfit, too. I love both of the looks. Just gorgeous. The colors look amazing together. I really like the gold on your lower lash line. That's it. You come over here RIGHT NOW and teach me how to do that. I'll man the bar. Yeeee drinks!